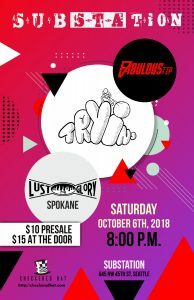 On Saturday, October 6th, Substation will be melting minds in Ballard with four sets of music by three of the Pacific Northwest’s most outside the box acts. Substation is Seattle’s premiere underground music venue, located at 645 NW 45th Street. Playing support will be, Lust for Glory, a straight-forward, three piece rock band with a rough edged “Lo-Fi” sense of rock and roll. Swinging from hard hitting riff to lilting, spacey melody (sometimes within the same song) LfG genuinely disregards the conventional ideas of what rock and roll ‘should’ be. Raw guitar and frenetic drums keep the already jagged sound from getting dull, the live performances ‘fresh’ and gives the listener the sense that they’ve caught the band with the garage door partially open. Don’t miss out on this opportunity to journey through the boundaries of space and tie with these three great acts!